Bhetala - Why Should Minister Die When King Returns? Once upon a time, King Marthanda ruled the kingdom of Simhala. Dharma Theja was his chief minister looking after all the affairs of administration and governance of the kingdom on behalf of the King. This was due to the womanising nature of the King Marthanda. Most of the time King Marthanda was immersed in all pleasures and was living within the royal palace. Occasionally, the King goes out for hunting into the forests on the outskirts of the kingdom. A rumour was widespread in the people that Chief Minister Dharma Theja was responsible for the behaviour of the King, as the Chief Minister wished to enjoy the royal status. Dear Sir, who are you? Why are you isolated in this jungle? King Marthanda pouring out all his royalty answered, Hey trader! I am the King Marthanda of this kingdom. I misplaced myself from my company while hunting and was taking rest here. My Lord! the trader said, My name is Dhanaguptha. I am heading towards Ghata Island on trading. Please come with me. I will show you a strange woman in the middle of the sea. King surprisingly said, a strange woman in the middle of the sea! Then I should definitely accompany you. I am coming with you. Thank you My Lord! Thank you for accepting our invitation, humbly replied the trader. Both of them sailed over to Ghata Island. The trader did all his trading in the Island for a big profit and took the King Marthanda round the Island showing him all the specialities of the place. Then they were sailing back home. In the middle of the sea, a beautiful woman was singing under a tree. King Marthanda puzzled to see her floating along with the tree on the sea and singing. Dhanaguptha submitted to the King, My Lord! This scene is a routine for us. As this is first time for you, you are getting puzzled. King listening him, slipped to the rear portion of the boat and dived into the sea. The moment he dropped into the sea, he entered into a beautiful town under the water. He roamed through the town and to his dismay he could not find a single inhabitant. Moving around the place he came across a great palace. He swiftly entered into the palace and he found a unparallel beauty of the world resting on a selectively decorated bed. Marthanda reached the bed and questioned the lady, Oh beautiful lady! Who are you? Why are you staying alone here? She replied in nectar filled voice, Charming Man! My name is Surya Kala. I am daughter of a Gandharva King. For reasons not known he left me here in all isolation. Marthanda said to himself in all pleasure filled tone, It is not for unknown reasons Beauty. You were left here for me. Then, he started praising her beauty and charm, giving his personal details in between. Surya Kala on listening his words shied. 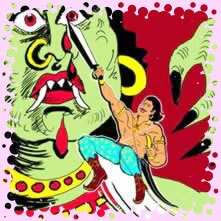 Believing that Surya Kala fell in his trap, Marthanda raised to hug her, she stopped him stating, Hey King! I too adore you as much as you love me. I do not have any objection to marry in Gandharva system. However, I have a condition for our marriage, which you should never overrule. Go ahead. What ever is the condition I do not have any objection to follow strictly, beauty assured Marthanda. I will be leaving you on the 10th and 11th days of rising moon and second and third days of decreasing moon. You should not object me she said. Marthanda agreed upon. They got married and were spending days romantically. When the time approached she started to move somewhere, as said earlier. Before leaving she warned, My dear husband. You please stay here. I will return according to the schedule. One more caution! Do not get into the well behind this palace. If you do so you will be exiting this world and re-enter your world on earth. Marthanda shadowed her to know where she was going. A little further, a great demon appeared and swallowed Surya Kala. King Marthanda could not control his emotions. He drew out his sword and fought with the demon and finally he could manage to kill the demon, after a prolonged fight. Immediately Surya Kala appeared out from the demon's body. She was in all celestial shine around her. With love he hugged her and asked, Dear wife! Who was that demon and what is behind it swallowing you? Dear Husband! Surya Kala explained, My father used to take very much care of me all through my life. He was not even ready to take his meal if I was not with him. One day, I reached home very late after having fun with friends. He was angry on my delayed entry and cursed me this way. I pleaded him to show solution to get out of his curse. Then, he said you will come and marry me. Then I will be swallowed by this demon. After you finish this demon I will be relieved from this curse. She continued, Dear Husband, it is time for me to leave to our Gandharva world. Kindly give consent. Marthanda was taken back on hearing this. He managed to control himself and decided to take Surya Kala along with him to his kingdom. He took her hand and talking to her and diverting her mind from her world, he took her close to the well she said not to enter. Showing all the love on her, he hugged Surya Kala and jumped into the well along with her. Both rose from the pond in the royal palace. During the time when the king disappeared, there were strong rumours in the kingdom that Chief Minister Dharma Theja killed the King wishing to grab the throne. Eventually, when the court attendees took the news of king and a divine lady coming out of the pond Dharma Theja was relieved of his tensions about the disappearance of the King. He rushed to the pond and welcomed them into the palace. That night, Surya Kala assured the King Marthanda, My Dear Husband! I will stay here forever, as I am ineligible to go to my world for stepping on to the earth. Marthanda was overwhelmed with joy to hear that. Strangely, Chief Minister Dharma Theja was dead the same night. Bhethala questioned the King Vikramaditya, You listened all the story Hey King of Kings! Now tell me what was the reason behind the death of Chief Minister Dharma Theja the same night when the King Marthanda returned to palace? Was that out of agony that he will be not be enjoying the royal comforts after the King returned? King Vikramaditya said, Bhethala, Dharma Theja was held responsible by the people for the womanising habits of the King. Now he is with a Gandharva queen now. Even if he performed all his duties similar to the previous days, he will be dubbed by the people that Dharma Theja was responsible for luring the King Marthanda with the woman and keeping away from governance. Understanding this, Dharma Theja committed suicide the same night when the King returned.